We’re very pleased to announce the release of a new version of the Kanji alive web application. It took a lot of time, and a great deal of work in particular by our main developer, Josh Day, who put in many, many hours of volunteer time to get us to this point. We owe him and the other developers who helped us along the way (Peter Thorson, Tanya Gray Jones, and Mat Wilcoxson) a great deal of thanks. Many of you will already be aware of the 214 traditional kanji radicals and their meanings page on our website. It is a comprehensive resource of all the kanji radicals, including not just their meanings, readings and stroke numbers, but also their position in the kanji, a note on whether a radical is a variant and an indication of the radical’s importance for learners. In the past, we were not able to include all of this data in the Kanji alive web application. Take the radical ⼑ (かたな) for example (“sword, knife”) which is also a kanji. As a radical, it has an important variant ⺉(りっとう) and it appears in the right-hand (つくり) position of kanji such as 則 (“rule, law”), 割 (“divide, split”), 列 (“row”) and 判 (“stamp, seal, judge”). In the old version of Kanji alive no distinction was made between these two radicals (⼑ and its variant ⺉). Both were listed as ⼑. In version 2, the correct radical variant appears alongside each kanji together with (for important radicals) a symbol indicating its position in the kanji. Adding support in Kanji alive for every radical variant required a significant effort — we finally even had to create our own custom radical font for this purpose. 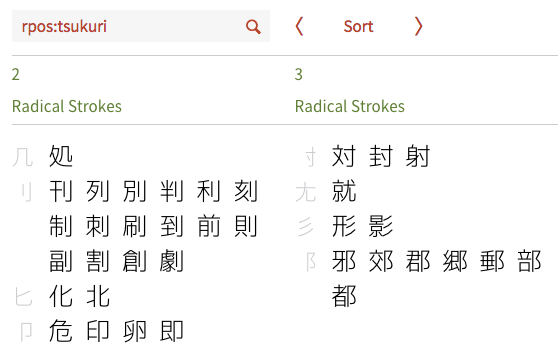 Since we had a complete list of all of the kanji radicals we decided to add a new way to search for kanji to highlight the positions a radical can take in a kanji, so that learners would be able to explore and better recognize these differences. Version 2 offers a new advanced search key called ‘radical position’ or rpos. With it you can find all kanji whose radical is in one of the seven main positions highlighted on our 214 traditional kanji radicals and their meanings page. In this way, you can search for kanji by radical position in Japanese or romaji. For example, rpos:かんむり will find all kanji who radical is located at the top of a kanji and rpos:tsukuri will find kanji whose radical on the right-hand side. This new feature is best exploited (as shown below) by using the ‘Sort’ button to view all the kanji in the result grouped by radical. In the past, if you were working with Kanji alive and wanted to share how you found a kanji or group of kanji with someone you typically needed to explain this in some detail. For example, if you just wanted to quickly share with someone how to find all the kanji in Chp. 3 of Genki, you would first need to explain the syntax of the advanced search term text:gen:c3. This could become frustrating and cumbersome. In version 2, there is a better way. Each search in Kanji alive is now automatically represented by a custom URL or web address in your browser which can be bookmarked, hyperlinked or simply emailed to someone else. To make use of this, just use Kanji alive exactly as before, then copy the URL which appears in your browser for sharing. In the case of the previous example this would be https://app.kanjialive.com/search/advanced?text=gen:c3. As you can see, the URL reproduces the components of the advanced search term and adds them at the end of the app’s web address. This works just as well for basic searches and even for individual kanji. Here are two more examples: https://app.kanjialive.com/search/read (basic search for ‘read’) and https://app.kanjialive.com/書 (kanji details for 書). Kanji alive has always tried to encourage a holistic or comprehensive approach towards learning kanji by including all the necessary information in one place. Writing is one very important aspect of this but of course reading is equally important and learners are likely to encounter kanji in many different printed forms in the world. This is why Kanji alive has long offered a way to view not just our own hand-drawn kanji but also printed kanji in the canonical Kyokashotai (textbook), and commonly used Mincho, Gothic and Maru typefaces. In Version 2, we’ve extended our support to include several important historical (Tensho, Gyosho, Kanteiryu) and one fresh (Suzumushi) contemporary style. It is important for students to appreciate that as kanji are an integral part of the Japanese culture they are still very much alive and constantly evolving. We hope that you will find the new typefaces interesting, challenging and even fun to read. We added ‘search for kanji by textbook’ support for TOBIRA: Gateway to Advanced Japanese Learning Through Content and Multimedia, and for vol. 1, 4th edition of Adventures in Japanese. For some textbooks it’s now also possible to distinguish between kanji which you must be able to learn to read and write, and kanji for reading only. Please consult the Supported Textbooks and Study Lists page for full details. You can now use Kanji alive on a tablet or large smartphone/phablet by zooming out until the app fits the width of your device in landscape mode. On most mobile devices, all of the interactive elements in the (kanji animations, typefaces, radical animations, stroke breakdowns, examples, audio for examples) can be used exactly as on a desktop computer. On smaller, and older smartphones, the kanji animations may play back in a separate view. For best results, iPhone/iPad users should update to iOS 10 or higher. Although we made an initial version of the language data and media files used in Kanji alive available some months ago on our repository in GitHub, we recently updated these to include new and updated material. All the language data and media is free to anyone to use, or re-use, for private and commercial purposes, under a Creative Commons CC-BY open-access license. We warmly encourage any developers who want to create their own Japanese language app (in particular, their own mobile app) to make use of our free API. We’d also be especially grateful to anyone who would be willing to volunteer their time to improve the Kanji alive web application. The full source code for the app is available on GitHub under an Apache 2.0 open-source license. The app’s GitHub repository will soon also include all known bugs in the app, and a list of potential enhancements. We’ve also made a number of other, more minor improvements. For example, we’ve added support for more keyboard shortcuts in the detail view, improved the appearance of Japanese text in Windows and on OS X, made it clearer that our dictionary references for Nelson refer to the ‘Classic’ and not the ‘New’ version, swapped Latin style parentheses for full-width and larger Japanese parentheses in the ‘Examples’ section and carefully reviewed and revised all of our language data, correcting a small number of typos and spelling errors. This entry was posted in News, Update on October 9, 2016 by Arno Bosse. We’ve just made a new test version of Kanji alive v2 available for testing under http://beta.kanjialive.com (many thanks to Tanya Gray Jones @ Oxford and Peter Thorson @ Chicago for improving the user interface and addressing bugs). A current version of Chrome, FireFox, Safari or Internet Explorer is required to use the app. Please take a look and let us know what you think! For an overview of the main new features in v2, please see this previous post. Combined searches (e.g. text:gen grade:3 or ‘all Grade 3 kanji in Genki’) sometimes ignore one of the two terms, and also place an ampersand between the terms after showing the results. Fixed. In Windows 10/Chrome v52, using the up arrow in the detail view shifts the whole app upwards. Fixed / not present in Chrome v53. If you see this, please leave a note in the comments. Thanks to the Otaku Team for reporting this error. In Safari, kanji animations often appear squeezed at first, then stretch to full width. Fixed in Safari v10. 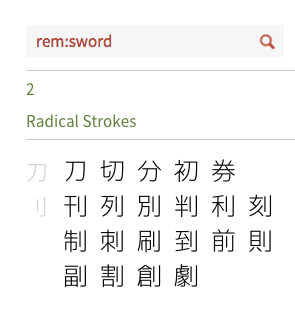 Down arrow(s) after initial search results does not show kanji stroke or radical stroke collations. This entry was posted in News, Update on September 5, 2016 by Arno Bosse. Following a request we are pleased to add support for a new textbook in Kanji alive: TOBIRA: Gateway to Advanced Japanese Learning Through Content and Multimedia, by Mayumi Oka (et al), Kurosko Publishing (2009). To search for kanji for writing & reading in TOBIRA by lesson please use the textbook abbreviation “jt”. To search for kanji for reading only, use the textbook abbreviation “jtr”. Please note that the following 13 TOBIRA kanji for reading only (the kanji 躍 in lesson 7, 環 in lesson 9, 及 and 徴 in lesson 10, 江 lesson 11, 隠, 丈 and 飾 in lesson 12, 憶 in lesson 13, 剣 and 雰 in lesson 14 恵 and 寿 in lesson 15) are neither second level JLPT kanji nor educational kanji and thus are not supported by Kanji alive. For more information on searching for kanji by textbook, please refer to the section on Advanced Search in the User Guide. This entry was posted in News, Update on April 21, 2014 by Arno Bosse. For further details, please review Supported Textbooks and Study Lists and the User Guide entry on Advanced Search. This entry was posted in News, Update on December 17, 2013 by Arno Bosse. Eri Banno, Yoko Ikeda, Chikako Shinagawa, Kaori Tajima, Kyoko Tokashiki, KANJI LOOK AND LEARN, The Japan Times News for Autumn, 2010. We added mnemonic hints for each kanji. You can read story descriptions of each kanji, using its components to help you remember how to write the kanji. Please note that these are not based on etymology. This entry was posted in Update on September 17, 2012 by Arno Bosse.